As a Nespresso Club member, you can enjoy even more exclusive discounts for your favourite Nespresso products to enhance your enjoyment of coffee, every single day. Celebrate the special moments with a very special gift that will turn coffee drinking into a true moment of indulgence! 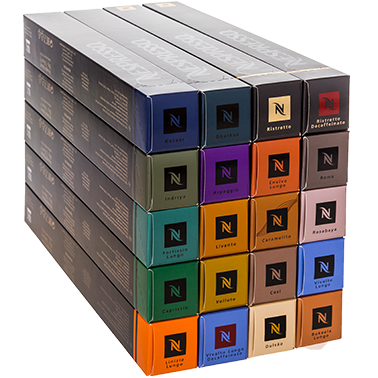 Choose now the perfect gift and enjoy the ultimate coffee experience with Nespresso exclusive coffee varieties. Free delivery for all orders with at least 200 capsules or when buying any coffee machine. Share the Nespresso experience and give people you love our special selections of roast and ground coffee. Make the perfect coffee at home with this Mild Summer coffee capsule assortment. Lightly roasted, these coffee pods make for great summer drinks. 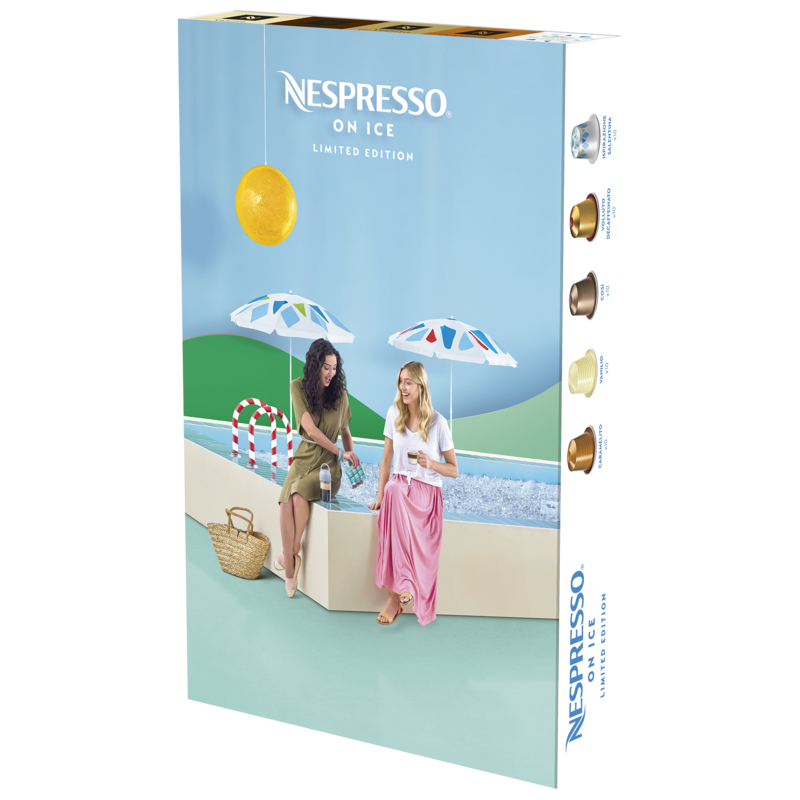 Enjoy a selection of five coffee varieties chosen by Nespresso coffee experts for the preparation of iced coffee recipes with milk. It`s the month of love and romance and we have a special gift idea for you: The Selection of 20 sleeves of roast and ground coffee. Discover Nespresso universe and enjoy the most sophisticated aromatic profiles, from delicate jasmin notes from Ethiopia to the creamy texture and intense roast of coffee beans from Brasil and Guatemala. Discover the perfect accesory for any coffee recipe lover. Achieve each time a great and rich milk froth, at the ease of pressing a button and create unique recipes using your favourite Nespresso coffees and creamy milk froth. Made for iced or cold coffee, the Nomad bottle will come along with you wherever you go and allow you to drink your iced coffee with a straw. Cap. :350 ml. Height: 21,3cm. Dishwasher safe. 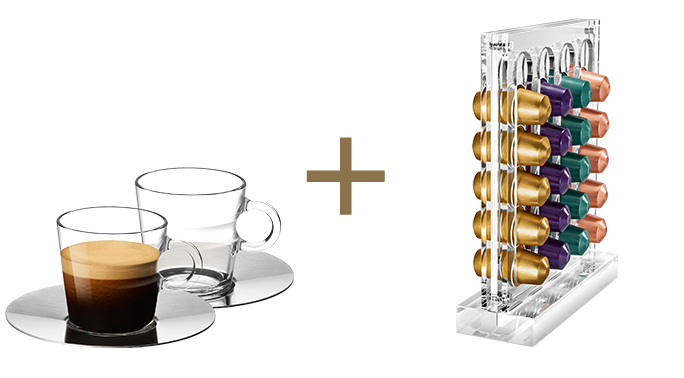 The perfect kit of 2 View recipe glasses, 2 lids and 1 ice cube tray to prepare iced coffee recipes at home. The silicone lid enables you to shake and mix the ingredients like a barista. The lid fits both View and Pure recipe glass. Dishwasher safe. 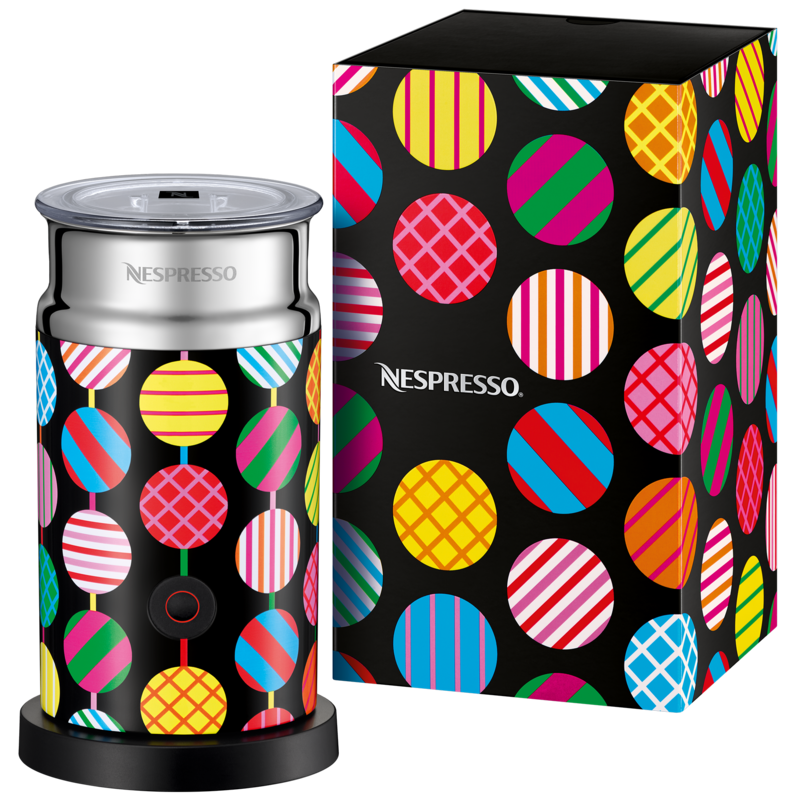 The limited edition Aeroccino 3 decorated with a Craig&Karl design, inspired by the candies universe, is an ultra-simple and fast automatic system for preparation of a light and creamy hot or cold milk froth. Aeroccino 3 milk frother can be a wonderful gift idea for cappuccino and latte macchiato lovers, who are eager to explore even more coffee and milk recipes. Choose the perfect gift for your loved ones, and let your imagination create wonderful moments. 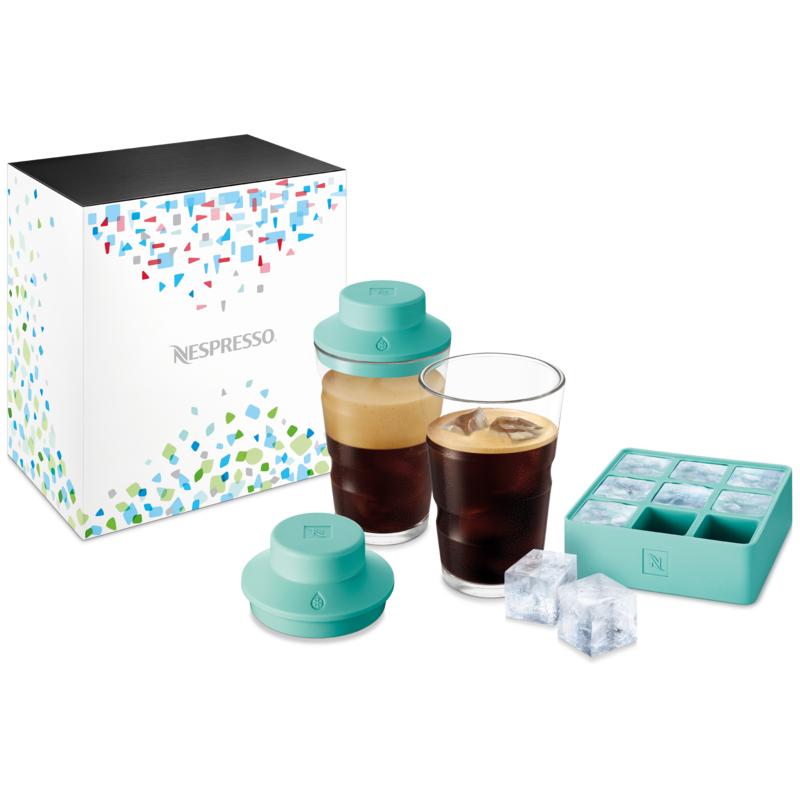 Enjoy special discounts for Nespresso Club Members and let yourself be embraced by our wide range of accessories, coffee cups collections that were especially designed to amplify the coffee aromatic notes, milk frothers decorated by faimous designers and extremly tempting sweets. 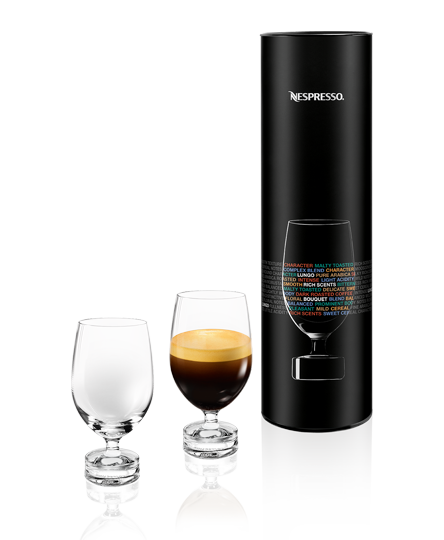 Designed by Riedel’s Glass Masters especially for those who are passionate about unique experiences, Reveal glasses amplifies the sweet fruity notes and cereal notes of our mild espresso coffees. Elevate your coffee tasting experience with our Reveal glasses collection in crystal-glass, designed by Riedel’s Glass Masters and discover all the aromatic profiles of the most intense espresso coffees. 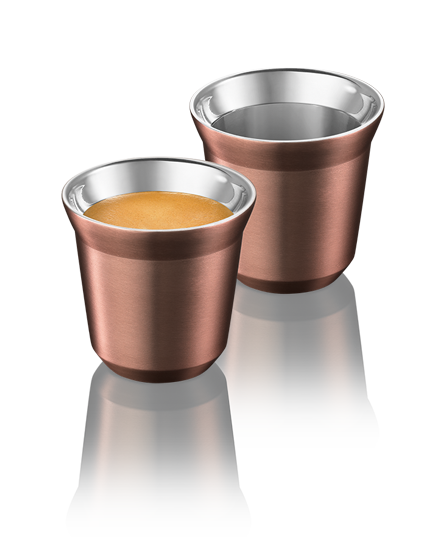 Arpeggio coffee capsule turned it`s shape and colour into a little cup, designed especially for espresso lovers. This can be a great gift idea for espresso lovers. 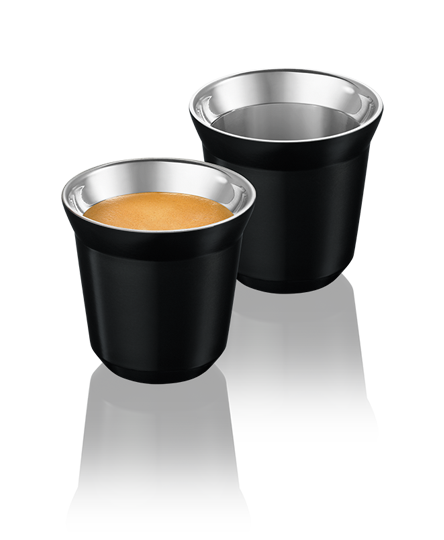 Enhance Ristretto coffee serving with a stainless steel cup matching the Ristretto capsule colour, especially designed for those who preffer very intense coffee blends. The most famous coffee assortment, Volluto, can now be savored in a stainless steel cup of the same colour and shape as the coffee capsule itself. Try Pixie Volluto cups when you enjoy your favourite espresso coffee and let yourself be indulged like a cinema star! Pixie Rosabaya coffee cups in stainless steel can be the perfect gift for your loved one, due to its very elegant design and delicate colour. Discover the traditional African coffee ceremonies and serve your coffee in style with a set of two espresso cups in tempered glass and a limited edition tray in stainless steel, designed by OÏ Studio in ”guilloché” style. Discover the traditional African coffee ceremonies and serve your coffee in style with the set of two lungo cups in tempered glass and a limited edition tray in stainless steel, designed by OÏ Studio in ”guilloché” style. Drink your coffee with style and discover the exceptional gift ideas that are waiting for you. 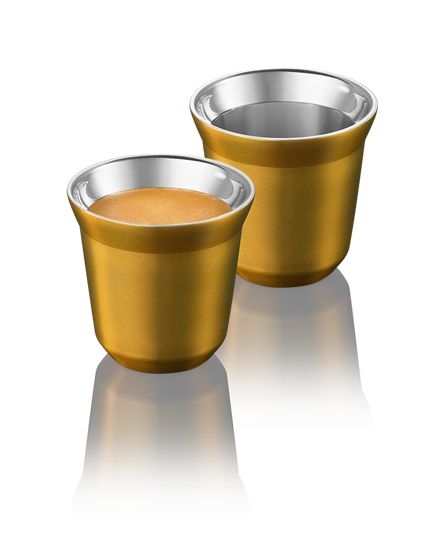 Make your beloved ones happy and bring joy with a perfect Nespresso moment. 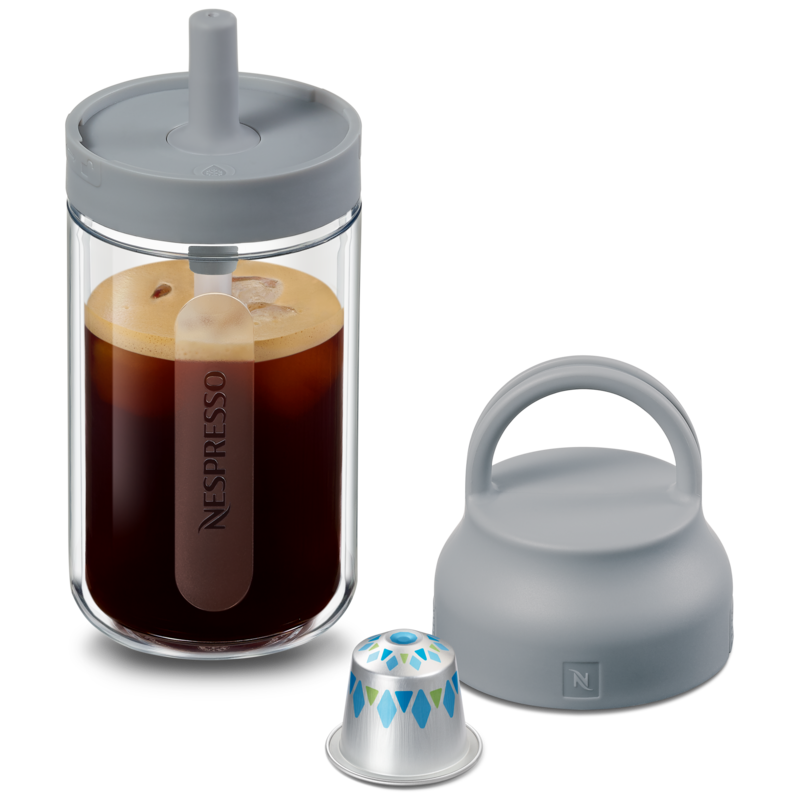 Offer your loved one a set of two espresso cups in tempered glass tohether with the transparent rocking capsule dispenser. Enjoy your favorite coffee with your loved one, admiring its colour, flavour and taste. 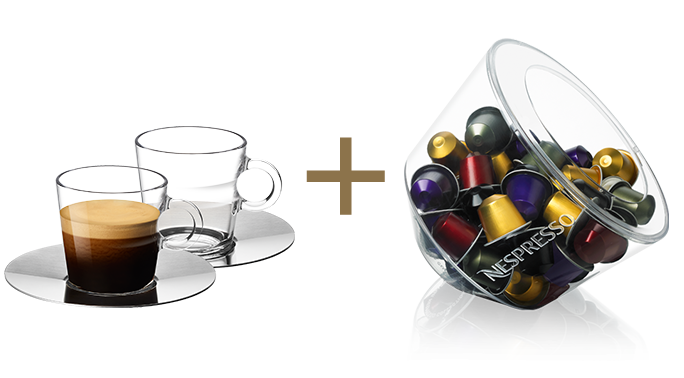 Display your favourite Nespresso capsules with a compact, transparent and versatile premium capsule dispenser and enjoy your coffee in the morning with the set of 2 espresso cups in tempered glass and 2 saucers in stainless steel with a shiny and brushed finish. 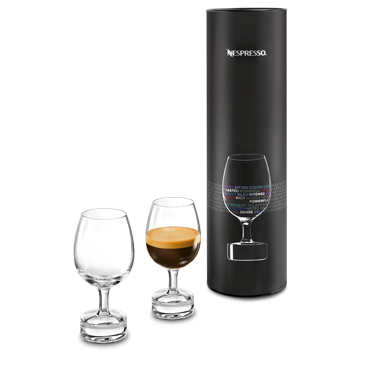 Offer your loved one a set of two cappuccino cups in tempered glass together with the discovery box dispenser. and enjoy top-quality Cappuccino in the comfort of your home. Why not treat your loved ones with irresistible sweets that will make their coffee moment perfect every day? We offer a selection of fine biscuits and cholocates, specifically designed and produced to enhance the aromas of each Nespresso coffee assortment, so you can treat your loved one with unique coffee moments. 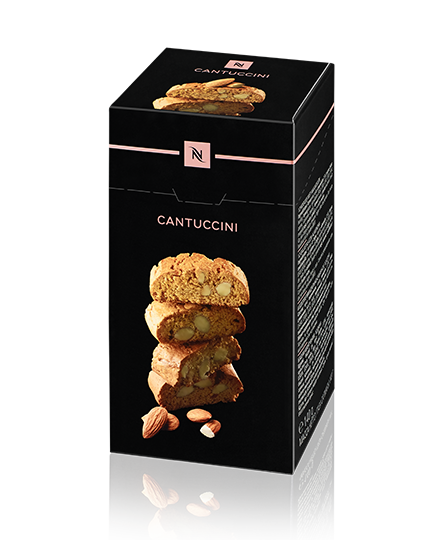 A crunchy gift made by following the recipe of a typical Italian almond biscuit. A sweet delight that will perfectly complement Nespresso coffee. These biscuits are made with whole almonds and honey, following a typical Italian recipe. They are baked twice for extreme crunchiness. Our unsurpassed coffee quality reflects our exceptional coffee blends, aromatic notes and roastiness techniques used by Nespresso coffee experts. But there is more! Discover a new level of coffee expertise with Nespresso machines which ensure high-pressure extraction of Nespresso coffees, as for you to enjoy the black nectar being poured into the cup, the smooth texture of its inviting crema and the unmistakable taste of your favourite Nespresso coffee assortment. The Aeroccino bundled with the new Essenza Mini C30 Black coffee machine, ideal to prepare of hot or cold milk froth for a wide variety of recipes based on both Coffee and Espresso. By concentrating its coffee knowhow and expertise into a brand new design, Nespresso has delivered its most compact machine yet – without any compromise on taste. - 1 Aeroccino 3 Black milk frother. 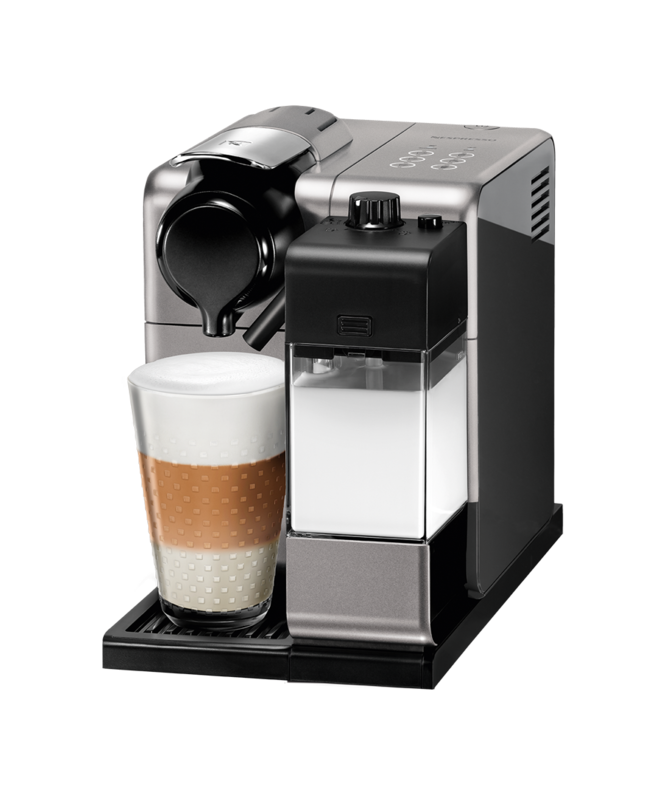 The Aeroccino bundled with the new Essenza Mini D30 White coffee machine, ideal to prepare of hot or cold milk froth for a wide variety of recipes based on both Coffee and Espresso. By concentrating its coffee knowhow and expertise into a brand new design, Nespresso has delivered its most compact machine yet – without any compromise on taste. Lattissima Touch Black: the “must-have” for every new fashion, due to its classy and elegant colour and incredible ease of use. 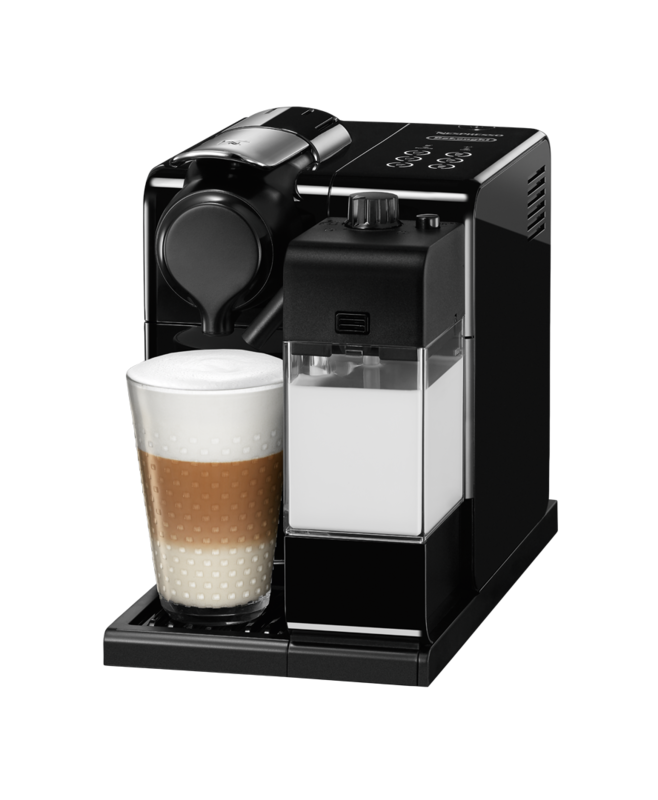 Lattissima Touch Black can be the perfect gift for coffee and milk lovers due to the ”one-touch” fresh milk system that prepares at the touch of a button creamy froth for cappuccino and latte macchiato recipes. Lattissima Touch Silver: the “must-have” for every new fashion, due to the refined colour and incredible ease of use. 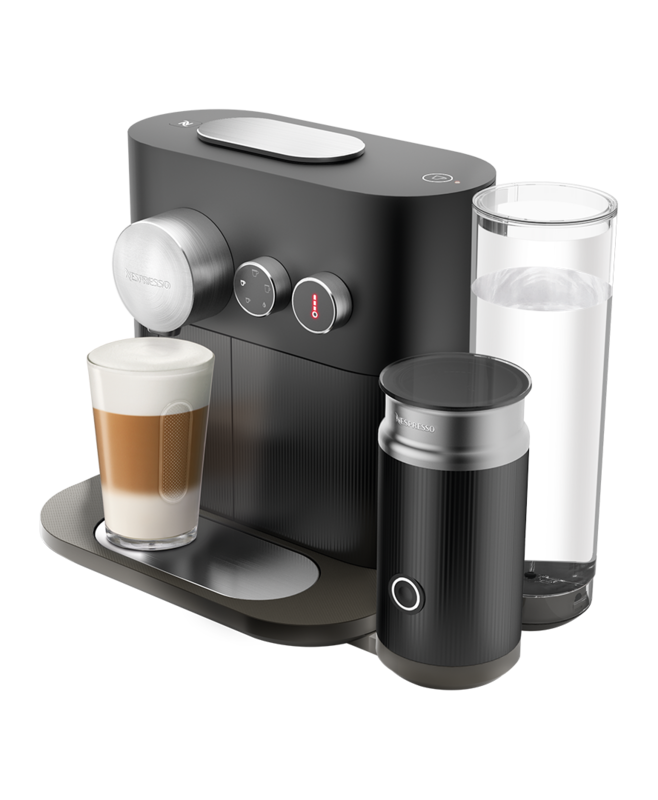 Well known for its sleek and modern design and the ”one-touch” fresh milk system, Lattissima Touch Silver is the perfect gift for those who want to enjoy at home the pleasure of many excellent coffee and milk recipes, like cappuccino and latte macchiato. 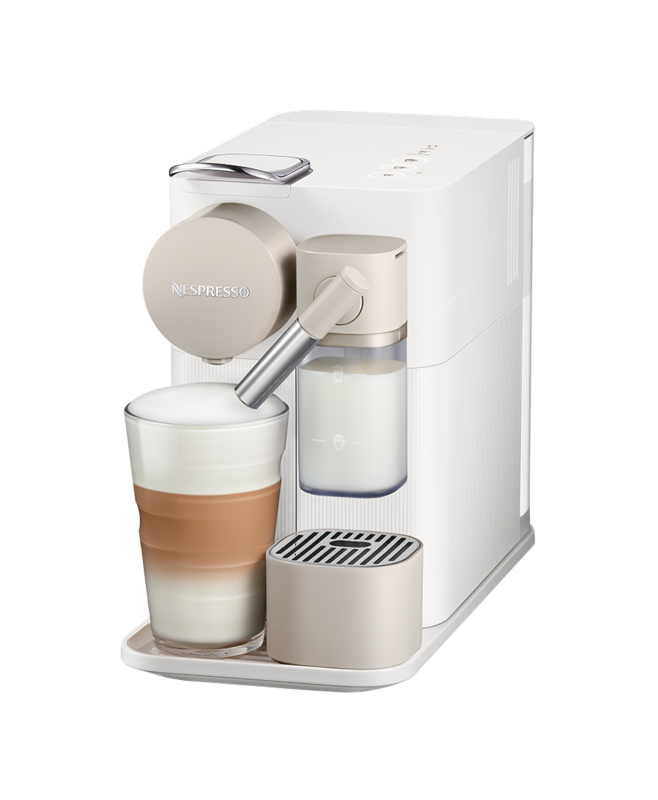 Lattissima One White enables you to occasionally indulge yourself with top-quality Cappuccino and Latte Macchiato in the comfort of your home. 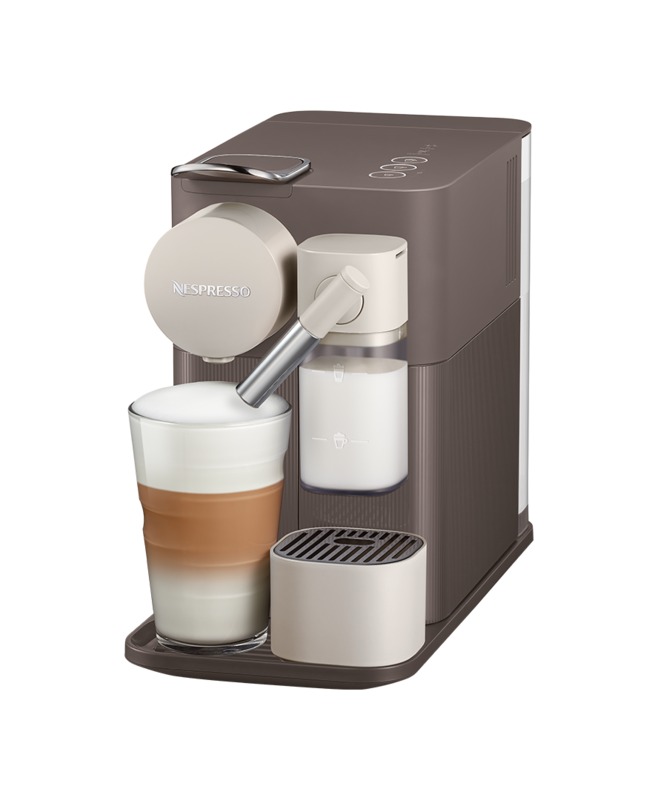 Lattissima One Brown enables you to occasionally indulge yourself with top-quality Cappuccino and Latte Macchiato in the comfort of your home. 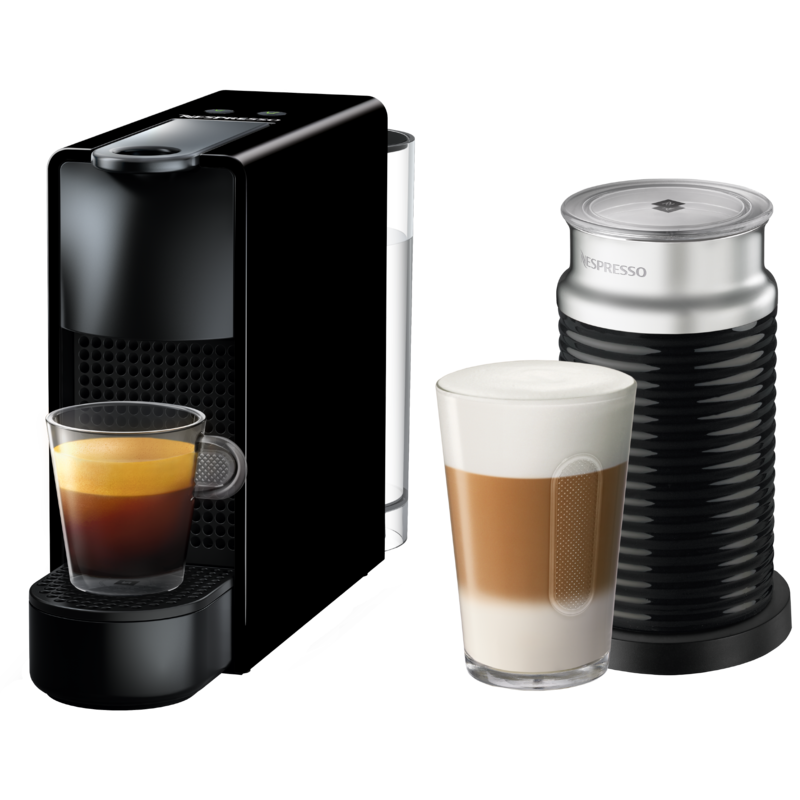 Nespresso Expert&Milk with fully integrated Aeroccino, offers a versatile level of settings with four coffee cup sizes including a new Nespresso Americano for a longer mild coffee experience, hot water and the choice between three temperatures. The Expert&Milk machine offers a unique design with a cutting edge flat-to-the wall shape inspired by the world of barista with brushed aluminum finish. Nespresso Creatista Plus enables you to easily create an authentic top-quality Latte Art coffee at home, thanks to Nespresso system’s convenience and coffee expertise. A technology brought for the first time to a portioned coffee machine. With Nespresso Creatista Plus, you can easily texture milk to the selected temperature and style for unique Latte Art creations and a broad range of delightful milk-based recipes: from silky smooth latte to creamy cappuccino. Do you need other ideas? 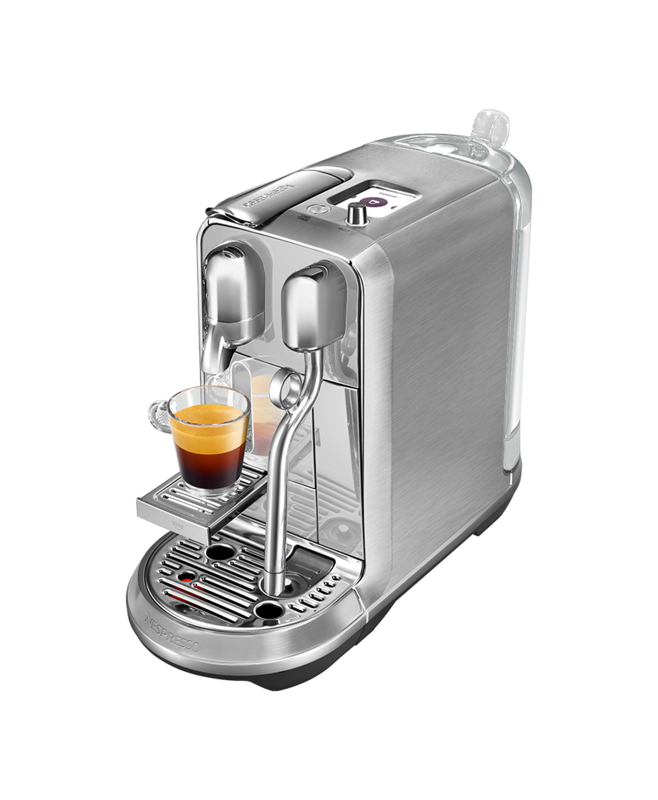 Discover all Nespresso machines. What is your loved one's favourite coffee? If you know someone well, you'll know if they're more into an Arpeggio, Ristretto or Vivalto Lungo. Why not take advantage and add their favourite coffee?